Experience the cuisine and culture of Paris, exploring Montmartre and the Marais district, before journeying through Lyon to Provence and the sunny Riviera. Arrive in Paris, where you are met and transferred to your hotel. Tonight, join your Resident Tour Director and fellow guests for a welcome dinner. After a guided tour of the Basilica of St. Denis, explore the City of Light, starting at the Panthéon, where celebrated historical figures, such as Voltaire and Madame Curie, are entombed. Enjoy lunch at leisure and, later, privately visit the Conciergerie, followed by an after-hours tour of legendary Notre Dame Cathedral. You may opt to ascend, by way of more than 400 stairs, to the top of this French Gothic-design landmark to take in the incredible city views. Tonight, enjoy a Chef’s Table experience with dinner, learning to make Crêpes Suzette, at one of the oldest restaurants in Paris. This morning, set out on a walking tour of the fascinating Marais district, and see the home of Victor Hugo. Enjoy lunch at the historic “Le Train Bleu” restaurant, housed in the Gare de Lyon, before boarding your high-speed TGV train. Arrive in Lyon and check in to your hotel. Stroll Les Halles de Paul Bocuse markets, noted for gourmet food ingredients, followed by a walking tour of the charming Old Town led by a local guide. Later, make an exclusive visit to a famed silk workshop, Atelier de Soierie. 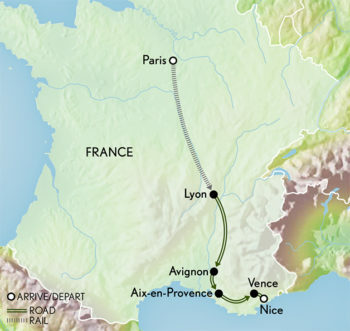 Follow the Rhône River valley, stopping for lunch and a wine tasting in the Châteauneuf-du-Pape region, before proceeding to historic Avignon. On a walking tour of Avignon, view the austerely beautiful Palais des Papes, a 13th-century Gothic fortress built on a rocky outcrop overlooking the Rhône River. Then, travel to Pont du Gard, to enjoy lunch in the shade of its gracefully arched Roman aqueduct, an engineering masterpiece dating to the first century AD. Later, stroll across the monument to visit the on-site museum and view displays that recount the construction of this ancient architectural wonder. Visit L’Isle-sur-la-Sorgue, home of Provence’s largest weekly market. Continue to Fontaine de Vaucluse for lunch in a typical Provençal restaurant. Tour a museum dedicated to Santons, traditional, handcrafted crèche figures of Provence. Later, enjoy a stop at a family-owned lavender farm. Depart for sunny Aix-en-Provence to explore the workshop of Paul Cézanne, guided by a local expert. Continue to Vence and your hotel. Then, meet the locals and get some coaching in the quintessential French pastime of pétanque. Try a friendly game and share a Scenic Sundowner overlooking the stunning Mediterranean. Travel to Grasse to visit the International Perfume Museum and attend a private workshop at the Fragonard Villa-Museum, creating a personal scent to take home. This afternoon, stop by the beach for a cocktail by the sea, and then return to the hotel for your farewell dinner. Today, transfer to the airport at Nice and depart.